Note: Preset is not applied for these items: ORSON, PITHREE, PORTON, HEARTSTONE, ACADEMIA, MEGATRON, HANDMADE, WOLVERINE, DARNA, INNOVATION, GROVE, ZORKA, CUPID. You could consult our guide on How G5Theme Options work for more details about the relationship between Theme Options, Preset and Page Options and How to use them to create your website. Preset are Page Options that were set beforehand to facilitate use, it will override settings in Theme Options on all pages applyed it. 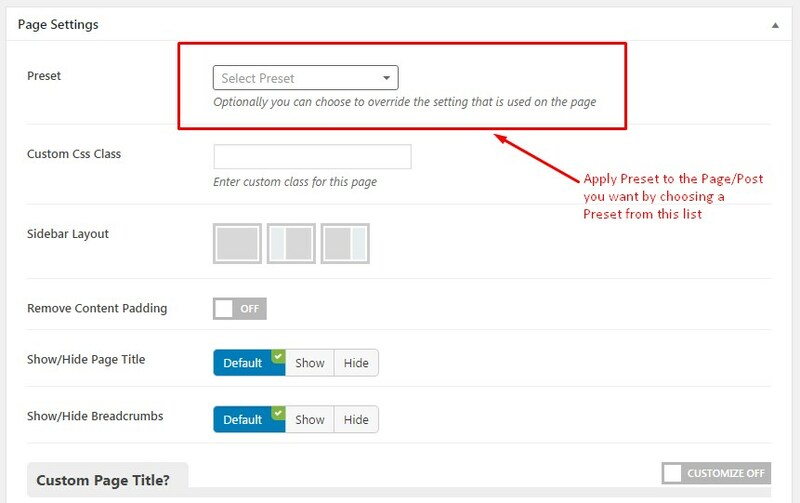 Access to Theme Options, select the Preset you want to apply to Theme Options then press “Load Preset” button to get all values from the Preset settings to similar options in Theme Options. Apply a Preset to Theme Options does not only affect to an option but also all options in Theme Options. Note: Once you choose a Preset and press Load Preset button, it will get all current values in this Preset and apply to options that corresponds in Theme Options (it means that if you change any option in this Preset later will not affect to Theme Options). Thank you for choosing G5Theme! !